Sporting gold medals and holding the championship trophy are (l-r) Melanie Kuhn, Rev. Chris Schwanz of Immanuel Lutheran Church and School in Marshfield Wisc., Sid Kuhn and Rev. Mike Kuhn. Although Alberta’s Kevin Martin rink failed to make the championship round at the Tim Hortons Brier in London, Ontario, another Alberta-based rink left the southwestern Ontario city with another curling championship in hand. The Kuhn rink, skipped by Rev. Michael Kuhn pastor of Foothills Lutheran Church in Calgary, took home the 2011 Friar’s Briar championship. The Friars’ Briar Bonspiel, known as “The Friars” is usually held in the same city as the Canadian curling championship. Pastor Kuhn’s team included his mother and father, Melanie and Sid Kuhn from Trinity Lutheran Church, Lacombe, Alta., and Rev. Chris Schwanz, pastor of an LCMS church in Wisconsin. Pastor Schwanz was introduced to the Kuhns by Rev. Laverne Hautz of Hope Lutheran Church in Port Coquitlam after they met at a Pastoral Leadership Institute Conference in the US. This is the fifth time Pastor Kuhn has competed in the Friar’s Briar; the third time with his parents. The best finish he had prior to this year’s event was a sixth place finish in Regina in 2007. In London, the Friar’s Briar attracted 16 teams from Ontario, Manitoba, Saskatchewan and Alberta. 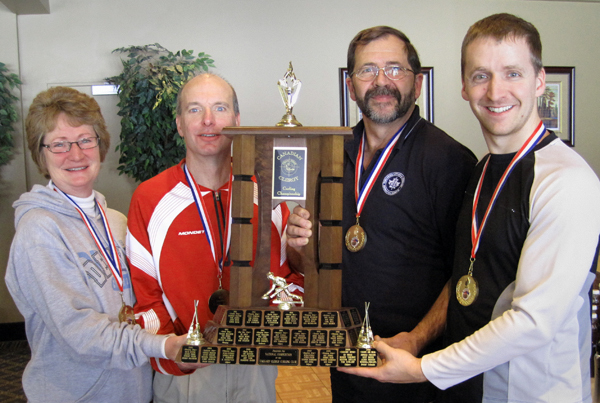 After the round robin play, Kuhn’s team had a 5 and 0 record and worked their way into the championship game by beating two southern Ontario teams skipped by Barry Klink, an evangelical missionary pastor, and Jeff Learmonth, the husband of a United Church minister. In the quarter-final against Klink, the Kuhn rink had to come back from a 5-point deficit to win. The semi-final against Learmonth was a battle of the only two remaining undefeated teams. It was a back-and-forth affair that saw the lead change five times. Kuhn scored 5 with the hammer in the 8th end to win by 4. The Championship Final pitted the Kuhn rink against a team skipped by David Hunter, an ELCIC pastor from Saskatoon. The Hunter foursome had beaten the Kuhn rink three times in the past two Friars Briars. The score was tied 4-4 after five ends of play, but the Kuhns scored 5 in the 6th end to open a big lead. After stealing three more in the 7th, the Hunter rink conceded the game, giving the Kuhns their first Friars Briar championship. This is the first Friars Briar won by an LCC/LCMS foursome. Kuhn’s days on the curling ice may be numbered however as he will begin training with Lutheran Bible Translators of Canada this summer, which could take him to much warmer climates in the future. Next years Friars Briar will follow the Tim Hortons Brier to Saskatoon. You can learn more about how to get involved by visiting www.friarsbriar.com or by contacting a clergy curling league near you. Woohoo!! Way to sweep your way into the gold medal! !